Steve, good luck on your project, glad the manuals could offer some help. Please post some photos as your project moves forward. The latest arrivals at a certain South Seas base I know of - the first HEMTTs in the area and A4's to boot! New (to me) antenna mount I am not familiar with. Would not work on an A2. 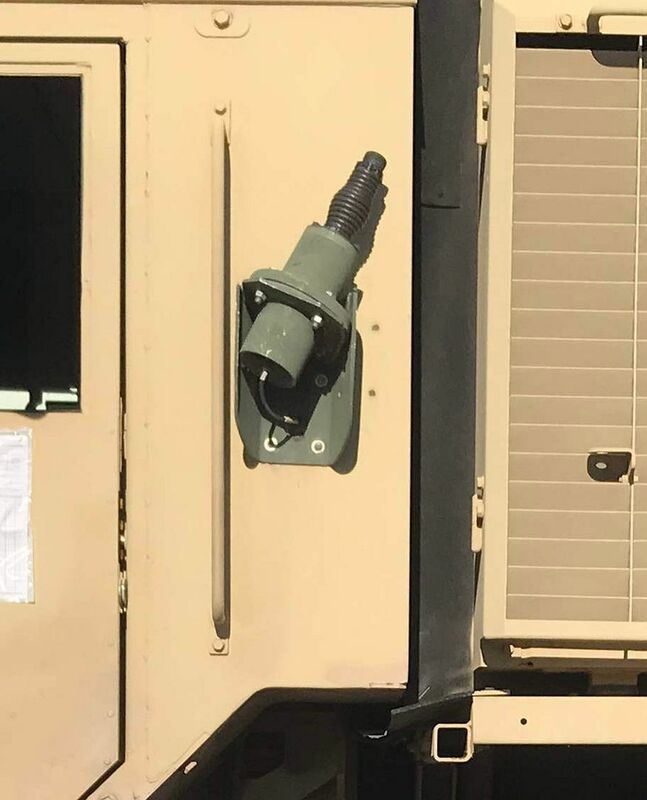 It looks to me like a standard antenna mount that is broke. The top plate looks like the welds were broken and in the process, it bent. Well Gino, I think you are probably right - though it looks like a design change the Army might want to consider. I see now that the top of the antenna mount is actually leaning in towards the cab body so yes, probably a bent mount rather than a new design. Darn, and here I thought I had found something new to talk about! 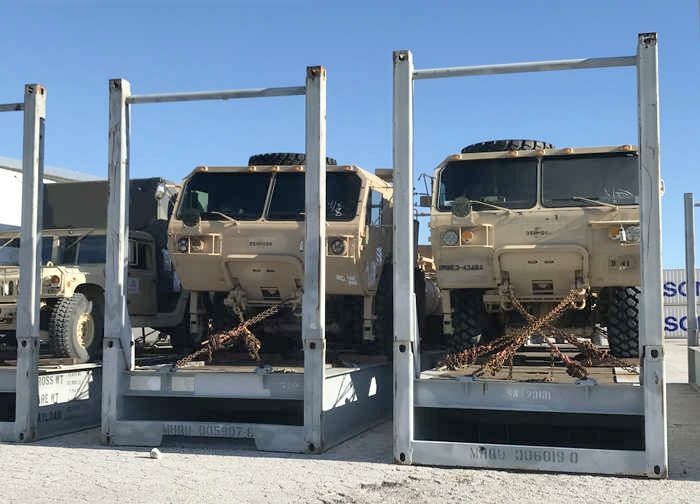 TM-9-2320-279-10-1 Operator’s Manual M977 Series, 8 x 8 HEMTT. TM-9-2320-279-20-1 Maintenance Instructions M977 Series HEMTT Vol 1. TM-9-2320-279-20-2 Maintenance Instructions M977 Series HEMTT Vol 2. TM-9-2320-279-20-3 Maintenance Instructions M977 Series HEMTT Vol 3. TM-9-2320-279-24P-1 Unit, direct support and general support maintenance repair parts and special tools list M977 series. TM-9-2320-279-24P-2 Unit, direct support and general support maintenance repair parts and special tools list M977 series. TM-9-2320-279-34-1 Maintenance instructions direct support and general support M977 series 8 x 8 HEMTT. 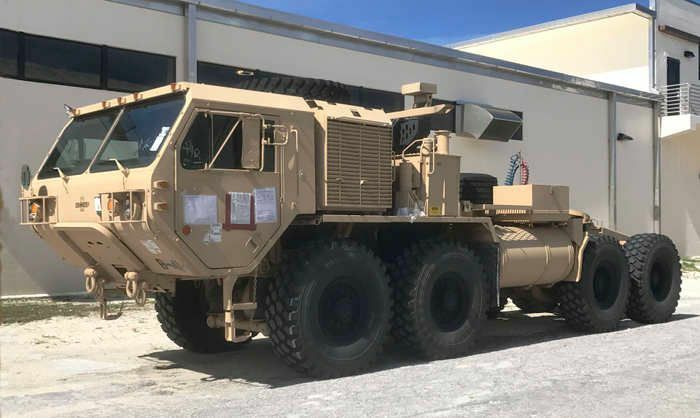 TM-9-2320-279-34-2 Maintenance instructions direct support and general support M977 series 8 x 8 HEMTT. TM-9-2320-279-34-3 Maintenance instructions direct support and general support M977 series 8 x 8 HEMTT. TM-9-2320-354-10 Operator's manual for controls and equipment found only on the M984 Wrecker-Recovery, 8 x 8 HEMTT. 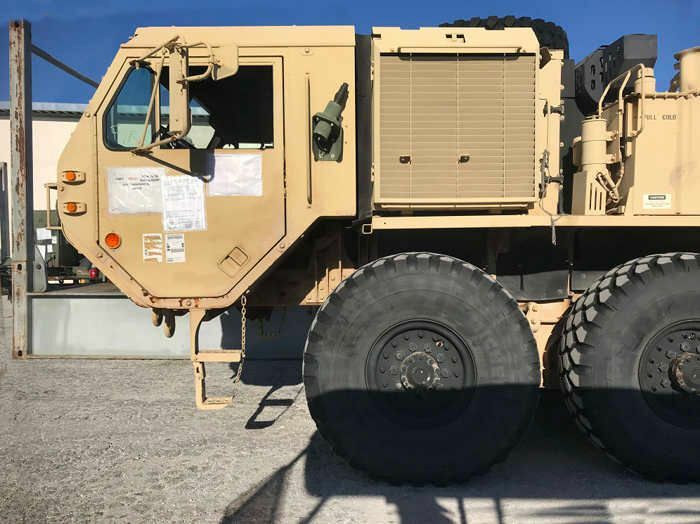 TM-9-2320-428-10 Operator's Manual for truck, cargo, 8X8 M977 with winch and M977 without winch. TM-9-2320-429-10 Operator's Manual for Truck,Tank, 8x8 M978 with winch and M978 without winch. I'm not clever enough at this stage to provide links but this list should be a good starting point. Some or all may already be familiar to you. I'm building an Italeri HEMT 977 and can't get the front deck/engine platform and fenders to sit level on the trucks frame. It's high at the back and kicks the engine cover forwards, leaving the cab positioned too far forward. The "engine" also sits too far back for the tranni to transfer case drive shaft to fit. I had to chop it down. I would not chop anything until you have exhausted every possibility for working with the engine deck to get it to sit level. Without seeing your model and working with it I cannot say what you are doing wrong. Everything SHOULD fit properly. I will admit the rear supports on the engine deck of the Italeri version were a little hinky and did not really support it properly. Cannot say if the Trumpeter offering has the same problems. Denis; Could those engine deck support legs towards the rear that run down to the frame simply be too long? I know on my Italeri model those legs were of different lengths (incorrectly.) I had to shorten some and lengthen others. That is certainly good news. Thanks for the link! Question: Where does this brace anchor in the other end/side? I always see it on this side of the vehicle and the bracket attachment you see here is included on the Italeri kit but I have yet to find a photo of where it terminates on the other side of the vehicle. The Eduard etch set for the tanker even includes this brace in brass but does not tell you where to anchor the other end to. This rod goes right across the vehicle to a bracket attached to the hydraulic reservoir. That's some strong reservoir as it also supports the engine air-cleaner. I can't see how to add a photo here but the bracket is a length of steel angle that rises vertically from the forward/inboard corner of the reservoir. It starts about half-way up that corner and rises about the same height above the top of the reservoir to attach the rod. See FIG.227 HYDRAULIC RESERVOIR ASSEMBLY - M984A1 Page 820 from TM-9-2320-279-24P-1. I hope this helps. It does, Steve thank you! It solves a question that has been plaguing me for months. 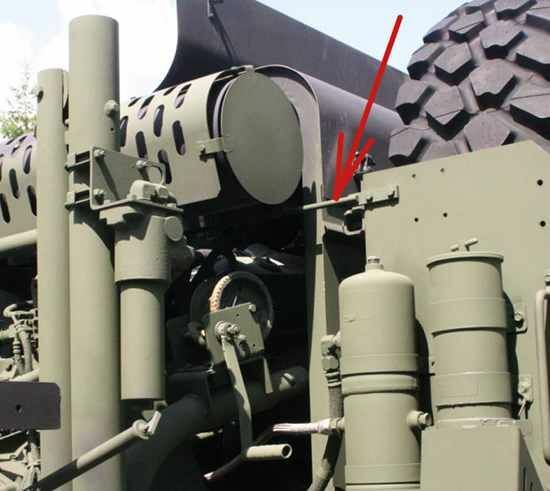 This rod is even included in some AM detail sets and I could always see where it is anchored to the spare tire frame but never was able to find where it was attached on the opposite side of the A2 vehicle. You can thank me, my M1076 scratchbuild is halfway finished. MMK, please hurry with the 1076 container trailer. 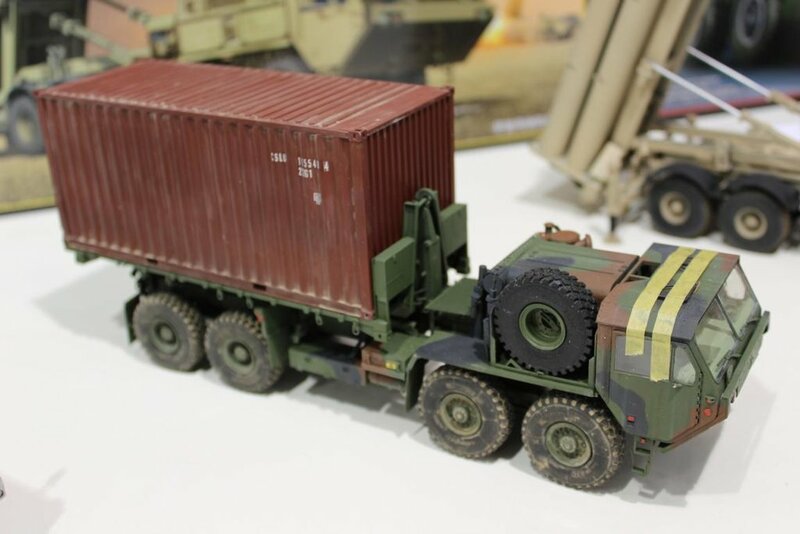 Has anyone recently seen in the after market any news announcements for decal sets in 1/35th to be used with the various 20' and 40' containers coming onto the model market??? And someone, please tell Italeri I am not going to have multiple containers on my dios and vehicles all marked "China Shipping"! That really steamed me - buy a 20" container kit at a somewhat steep price and be offered only ONE set of markings without even the inclusion of a US Army option. Something interesting. I have found a full sprue layout of the Trumpeter THAAD. 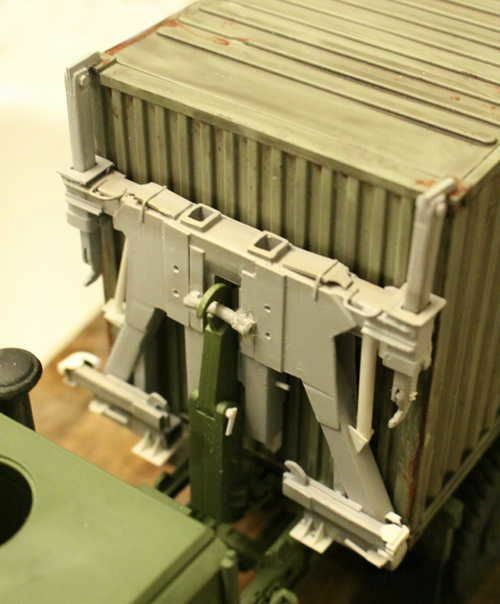 The kit includes all the parts for an M1120 LHS. It has all the parts from their M983 kit, so you can build an LHS from it. Check it out here. I may not wait for the promised Trumpeter M1120 kit and just get one of these and build it as an M1120 w/the 3D CHU and scratch CHU supports. It may be worth it based on their release schedule. The only hope I have on the delayed release is that Trumpeter is doing the CHU after all. The rest of the M1120 is already there. 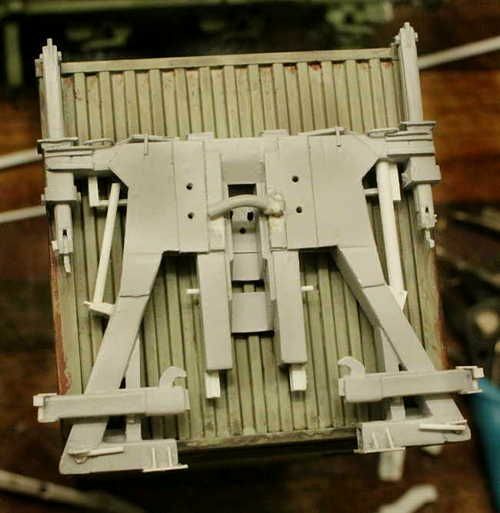 Well that still leaves us having to build those rear container guides but that is interesting. Maybe that is why Trumpty is holding off bringing their's to market, they have to come up with those guides. If I can ever get over this love affair with aircraft that I seem to be having right now I would set a goal for myself to finish the experimental Oshkosh 8x8 LHS (with the CHU and container guides.) I have hopes this will happen with the new "Scratch Builders" campaign that just started! Uuugggg!!! This pic from Nuremberg is still showing it w/out the CHU. What we need are some scaled blueprints but Oshkosh ain't share'n. More bad news from Nuremberg. Definitely no CHU.